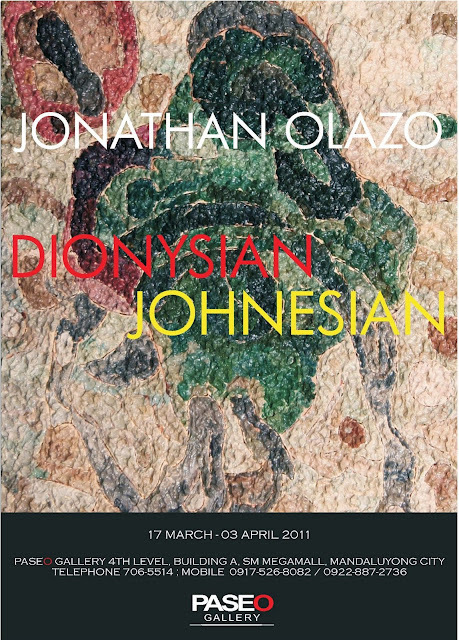 Jonathan Olazo opens with another one-man art exhibition entitled, “Dionysian Johnesian” in Paseo Gallery on March 17, 2011 at 6pm. The gallery is located at the 4th Level, Building A, SM Megamall, Mandaluyong City. Exhibition runs until April 3, 2011. Not to, or no less stranger than, the artistic arena of the allusive and metaphorical where truths in the face of the fictitious, the artist has put together description at odds with each other, and are actually antithetical statements about himself. 'Johnesian pays homage to the American painter well versed in his cunning and witty methodologies; 'Dionysian' refers to the to the figurehead of the abstraction embraced by a pivotal generation of painters embodying such bacchanalia in their work. Both ideas baffle and engage the artist at large, mingling those in a platform perhaps not yet at all concerned with a predictable outcome,but only to fuel a compulsion to make art and engage in a timeless vocation.